Gutters protect your home from serious damage caused by rain, snow, ice and debris. Undrained moisture can find fissures in roofing and proceed to destroy that roof in addition to the ceiling and rooms located below. Since gutters are an important asset in protecting your home and the valuables within, have you considered how important it is to protect the gutters too? At Michiana Gutter Pros, we offer top quality gutters and the very best protection to keep those gutters functioning like new. Basic gutter guards provide a perforated lid attached to the top of the gutter. In typical use, the gutter guard may prevent leaves and other debris from entering the gutter and clogging the downspout. Unfortunately, these basic guards provide no additional assistance for torrential rains or a drastic drop in temperatures which create snow or ice. 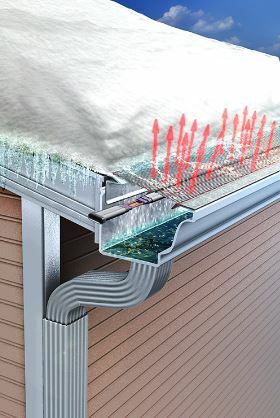 The introduction of heated gutters has given homeowners the advantage of removing snow and ice by attaching heating elements directly to the gutters. Many of the heated gutter systems require the installation of new gutters and a constant wattage heat cable. While these systems prevent ice build-up, heated gutter costs vary with each system. If you live in Mishawaka, Indiana and like the idea of gutter heaters, we have great news for you! Michiana Gutter Pros now offers heated gutter helmets. For better drainage, the heated gutter helmets incorporate a patented nose forward design that allows debris to fall to the ground as maximum water is captured and directed through the newly heated gutters and downspouts. Professionally installed with heavy duty mounting brackets, the Gutter Helmet also includes a Triple Lifetime Warranty for that added piece of assurance. Drainage is good but extra protection against destructive ice is great, which is why we also offer heated gutter helmets which are self-regulating, heating cables that are installed beneath the gutter cover. Designed to be attached underneath your Gutter Helmet, the cable and attachments remain out of sight. With a flick of a switch, you can have gutter heaters whenever you see a build-up of ice or snow. Because you control usage, the cost to operate is kept at a minimum, unlike other gutter heaters costs that continually run. After a quick inspection, we can provide an estimate of having Gutter Helmet and Helmet Heat installed on your home. Certain factors such as the size of your home, condition of your roof, type of roofing, etc will assist us in supplying an accurate quote. Heated gutter guard reviews describe our installation of the heated gutter helmets as “a wonderful addition” to their property and “the only choice for gutter heaters.” Our professional and courteous technicians are also residents of Mishawaka and know how devastating poor roof drainage can be to your home. During the installation process, we are respectful of your privacy and schedule. We give our full attention to your home to avoid delays or changes that would create an inconvenience. Are you ready to leave the hassle of cleaning clogged or frozen gutters in the past? Have you been interested in installing heated gutters but were concerned about the cost? Are you ready to see how affordable heated gutters cost? ​If you said “YES” to any of these questions, contact us today for a no obligation consultation.